The Connemara Hotel, Madras’s oldest and now the Taj Connemara, celebrates a 2-year restoration (Also see the article Tea-time at the Connemara again). It is not often that we at Madras Musings have occasion to celebrate when it comes to heritage. Most of our stories are gloom and doom, chiefly documenting official apathy and wilful neglect that results in various grandiose edifices biting the dust. But in this festive season, we do have a reason to rejoice. 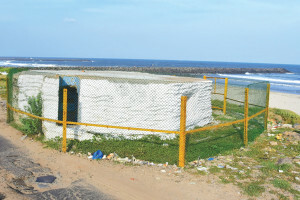 We, a few days ago, saw the low profile restoration of the Second World War shelter that had for long remained neglected by the seashore at Kasimedu. This marked the culmination of some concerted action by several agencies and we are glad to report that Madras Musings too played a role in it. The concrete air-raid shelter, also known as the pillbox owing to its design, was one of several put up all along the seacoast by the administration of Sir Arthur Hope, during the first three years of the WWII. Weighing several hundred tonnes, it was probably cast in-situ and apart from its massive walls, it also has evidences of metal plating on the inside. Narrow windows provide a lookout and also enable the positioning of anti-aircraft guns. Records on these shelters are non-existent today and, indeed, there is no proof of ownership either. The last named was a bane and a boon, when it came to the recent restoration of this particular shelter, the last survivor of its kind. It had remained neglected for years and served among other things as a dwelling, a public convenience and a rubbish dump. It would have gone on that way, hardly noticed by passersby had it not been for it lying plumb in the middle of the route for a proposed pipeline of the Indian Oil Corporation Limited (IOCL). That necessitated bringing down the shelter and demolition work began in October 2017. That was when Madras Musings was alerted about this and carried an article in its issue dated December 16, 2017. The Hindu, one of the supporters of Madras Musings, followed up and the city news desk published a detailed story. That got the IOCL interested and they willingly suspended the demolition. 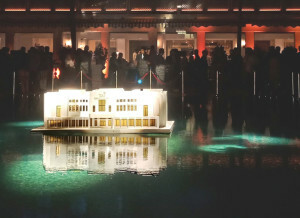 The Corporation of Chennai was kind enough to offer its services for shifting the structure to the Museum if the latter was willing to host it and, more importantly, if the owner of the shelter had no objection. A scramble began on establishing ownership over the bunker. The ASI and the Army had no records. Strictly speaking, the structure was poromboke, for it stood on public land and nobody had a claim over it. The IOCL then offered to retain the shelter at site and, what’s more, decided to repair whatever damage had been done by way of demolition. This was soon attended to, the quick action being possible chiefly because there were no conflicting Government departments squabbling over it. The shelter was given a coat of paint as well and gleams now. The IOCL has cordoned off the structure and also offered to put up a plaque on it, explaining its history. The route of the proposed pipeline has been changed so that the shelter remains undisturbed. The IOCL will also hopefully maintain the structure. It is rather ironic that while several edifices of the city have bitten the dust or continue to crumble, the humble pillbox has proved a survivor, almost like Cinderella. It was thanks to coordinated effort among various agencies that there was success. Now if only the YMIA read this and began focusing on Gokhale Hall, or the SBI thought of what could be done to its magnificent First Line Beach office or the LIC pondered over Bharat Insurance Building the same way, the future of heritage in Chennai could be a lot brighter. Editor’s Note: Your Editor being of Word War II vintage, has a rather different view about air raid shelters and pillboxes/bunkers. The latter were meant as ‘mini-forts’ for defensive purposes, in this case, coastal defence. Machine guns were their main weaponry. Air raid shelters were ‘civilian’ spaces, meant to be shelters for the local public during an air raid. Would be glad to hear the views of someone from the Army.